By taking “whole system” approach and looking machine, its use, and components, these new specs will reduce energy using and greenhouse emissions equal 7 million cars. In almost every window and door manufacture, they have glass lines. 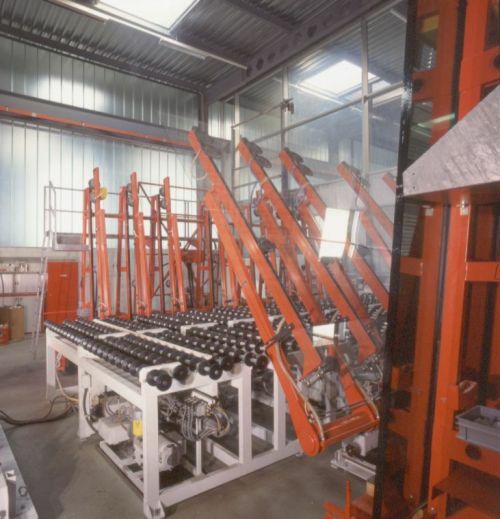 In the glass line, the first machine is glass loading. Let us take a look on two basic types of loading machines for cutting lines that are majority using in U.S.
1. Tilt Loading --- It uses a combination of hydraulics, suction cups, and sensors to identify and retrieve glass from a vertical pack and transfer it to a horizontal position for downstream processing. It applied four or six moving arms with big cups to hold the glass sheet and put it down on table. This is a traditional way. 2. Automatic Free-Fall --- It is intelligently designed to robotically retrieve and free-fall glass, then convey it to the cutting table without operator intervention. It uses one cup to peer glass sheet out to free-fall it down on the table. This is a new way of loading invented in United States. By comparing two loading ways, there are three facts that make big difference. 1. The Tilt Loading takes the whole glass sheet up from rack and put it on the table while Free-Fall only pulls glass sheet free falling down on the table. The first way increase the potential energy and moment energy on glass that consumed the power energy. The second way transfer potential energy on glass of its own to moment energy from high position down to low position on the table. 2. 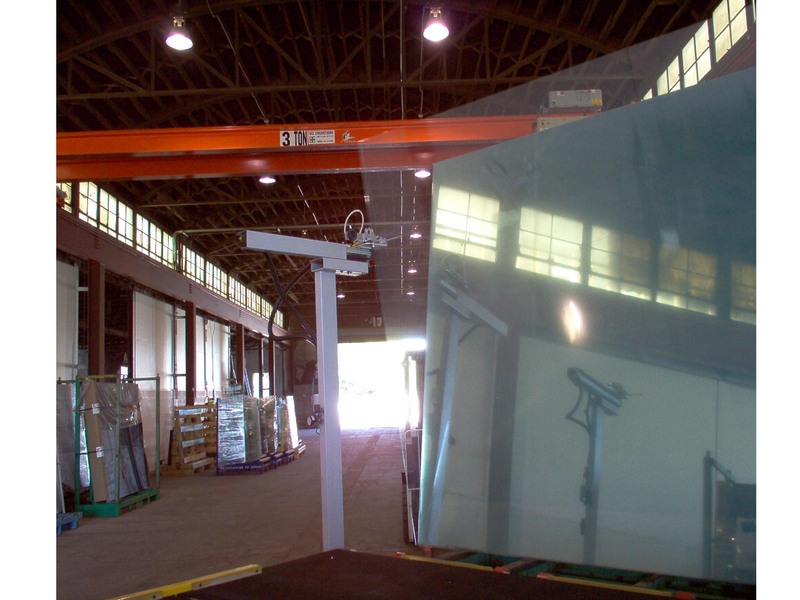 Because of tilt loading takes whole glass up and down, it need heavy cups and stronger arms to hold the glass, the moving parts of Tilt Loading are more than ten times than the one of Free-Fall. The heavy moving parts cost more power energy to accelerate them to move. 3. The Tilt Loading uses hydraulic system installed in the machine to move the big arms. When the arms in rest status, the motor continually run and system still consume the energy by pressure regulator that transfer the power energy to the heat in oil, which is backward comparing with second way driven by pneumatic system. As result, the differences of energy consumed are 15 times. In addition the second one uses less parts and materials that is the other kind of “green” because parts and material cost energy to make and transport. In any innovations and R&D, it is usually happened that one advantage happened brings another advantage. It is the same for energy saving on machines. Energy saving on machine almost always comes with increase productivity. Because the machine mess and parts are decreased in energy saving, they are more easy to be accelerated and decelerated that can increase machine moving speed and improve machine performances. Then finally, the productivity is increased in the glass lines that is dream of every business owner. In this case, the glass cutting line increase 87% productivity by using free-fall automatic loading machine. Please see Case Study. Copy right ©2002-2009 Smart Line Systems Inc.